Colours are able to lift the mood and create an ambience, sunny yellow is most definitely the king of mood lifters and always makes me happy. So, are you stuck in 2 hours of snail-pace traffic on Third mainland bridge? 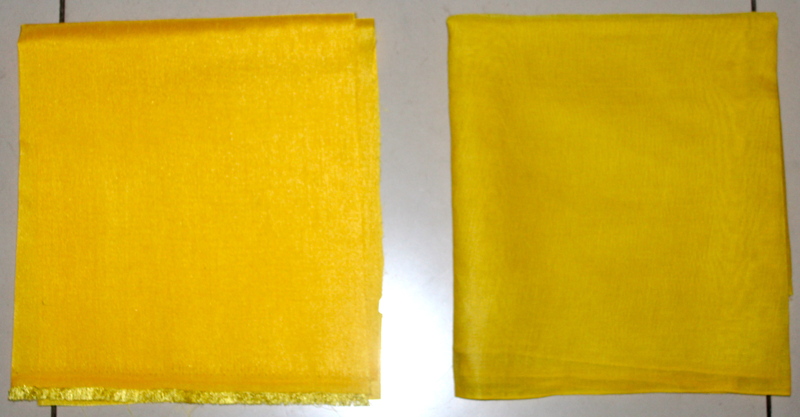 Yellow!! . Did PHCN (with)hold power for 2 weeks? Hello Yellow!! . FRSC caught you with an invalid driver’s license? Mellow Yellow!! (erm…take forced enthusiasm with several pinches of salt). Midi-length full skirts are trendy now, it’s lovely how the silhouette is oh so lady like and grown-up chic. When I drafted this box pleat skirt, I wanted to do something a little different, so I sewed the pleats “doubly-boxed” or shall I say “boxed-box” where each set of pleats consists of a back pleat and a narrower front pleat on top. For the shell, I used a synthetic silk fabric and for the lining, I used a light cotton fabric. Box pleats are rather interesting, two-faced really, as the reverse-side forms an inverted pleat design. Beautifully stitched crisp pleats require a significant amount of precision and pressing/ironing is also a key part of the sewing process. 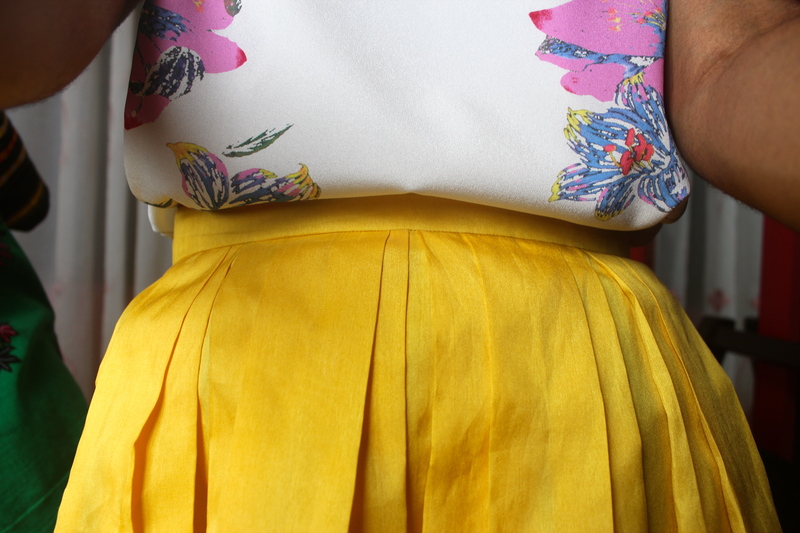 It is, without a doubt, a very pretty skirt. Love this…I agree this skirt is soooo ladylike. The color is gorgeous! Thank you, yes, it’s a very happy colour. I knew what I was saying when I said I saw bright YELLOW and NEON here! Just look at this! I love this. Lool. I love the theme “Half of a yellow sun”. Lool. Your blog really helped me to understand I still have a long way to go in designing, the fabrics and all. It really inspired me. I think I am ready to learn. Lol. You are most welcome Sekoyin. Wow. Yellow is my favourite colour. I wear it all the time here. The people in England shy away from bright colours especially in the winter months that are cold and horrid. But the Nigerian in me wears bright colours. You have to do something with your talent. We need you here! Lol @ “the Nigerian in me”. Quite true, I embrace colour wholeheartedly, the brighter the happier. This skirt makes me happy! I love the vibrant colour and the feminine silhouette. The weird thing is I like vibrant colours but I never buy bright fabrics. My closet is filled with black and grey outfits. When I’m not wearing African Prints I’m usually dressed like a ninja / bank robber ..all black everything. I’m slowly trying to incorporate colour into my life though. I haven’t made any outfits with box pleats …so I’m adding this to my to-do list. Me too 😀 full skirts are winning, seems like the trend will last a while. Ah! I am still laughing madly at “dressed like a ninja / bank robber”. A splash of colour is always nice, I am attracted to jewel tones and I have a stash of fabric that I really don’t need but purchased simply because the colour was seductively batting eyelashes at me *sigh*. 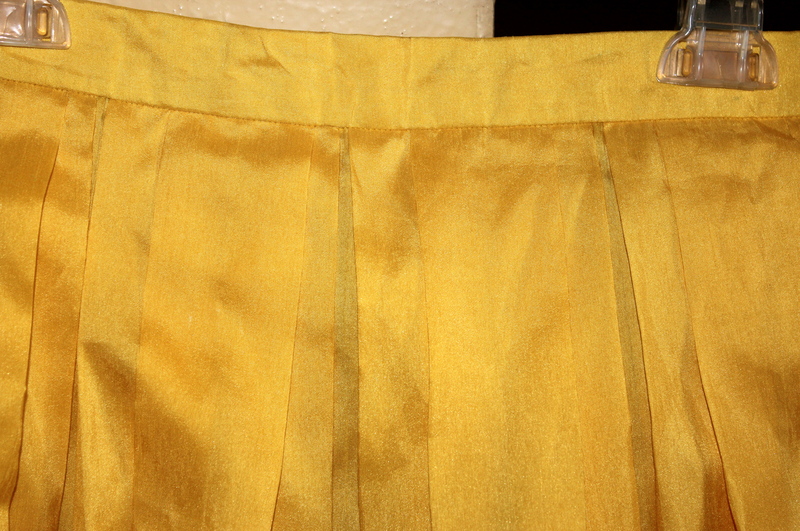 You should o, box pleats are fun to make. Spell check palaver, lol. The thing that never fails to crack me up is autocorrect. Beautiful! I love that yellow skirt and top. They go perfectly together. super cute. I love that yellow. Hi Nedoux, I’m happy to have the opportunity to see your blog. 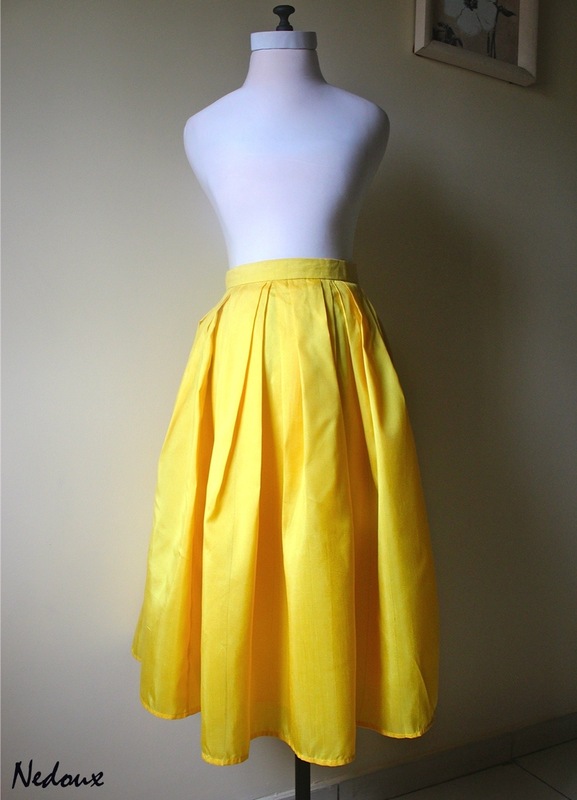 The yellow skirt is so lovely and classy. I’m inspired to try the pleats and the colour!